Gearhead Sliding (GSD) style commercial door operators employ lubricated gears for heavy industrial, high cycle applications. GSD-style operators offer functionality that is similar to GT-style operators, but are used on single and bi-parting sliding doors. MyQ® Technology enables you to securely monitor and control your facility operator and lights with your smartphone, tablet or computer for greater peace of mind. Alerts can be received as email or pop-up (push) notifications on a mobile device, ensuring the status of your commercial door. MyQ Mobile App is a free download with no annual activation fee. Dual Voltage Connections increase flexibility by enabling the installer to select the required voltage within phase, to meet job-site requirements. Single-Phase: 115V and 230V, 3-Phase: 208V, 230V and 460V, 575V is a discrete model without field-selectable voltage. Heavy-Duty Worm Gear-In-Oil Gear Reducer delivers performance for heavy industrial, high cycle applications. Control Function Selector Dial enables easy selection and programming of (7) wiring types, from constant pressure to close, to specialized Timer-to-Close functionality to meet end-user needs. 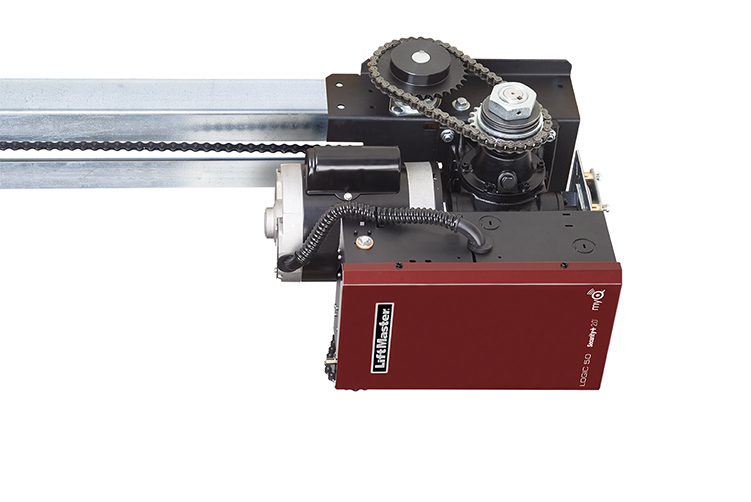 Continuous-Duty High-Starting Torque Motor performs in demanding industrial overhead door applications. Motor Removable without Affecting Limit Switch Settings saves time and money for maintenance. Adjustable Friction Clutch helps to protect door and operator from damage should the door meet an obstruction. Mid-Stop enables partial opening of door to a preprogrammed position for energy savings, time savings and convenience. Maximum Run Timer reverses or stops door if closing time exceeds expected time-frame to limit damage to door and operator. Delay-On-Reverse Circuit prevents abrupt reversal of door, reducing wear on the door and operator system. 3-Button Control Station with Maintenance Alert System (MAS) provides open/close/stop functions and notification when routine maintenance is required. Continuous-duty high-starting torque motor with instant reverse and overload protection. Available in 1/2, 3/4, 1 and 1-1/2 HP; single- or three-phase. Capacitor start on single-phase. Removable without affecting limit switch settings. Operators are factory preset to C2 wiring, providing momentary contact to open and stop, with constant contact to close. 10:1 first-stage using heavy-duty gears running in oil bath; cast iron housing; #41 chain second stage; #41 output chain on trolley. Sealed roller bearings in gear reducer. Flange-mount industrial ball bearings on drive shaft. Brake standard on all GSD operators. NEMA 1 type electrical box, heavy-duty 11-gauge steel frame with durable powder coat finish, all reduction sprockets drilled and pinned to shafts. #41 Trolley Roller Chain standard on GSD Operators. UL 325 requires all commercial door operators to be either constant pressure to close or be equipped with a primary external monitored entrapment protection device. Security+ 2.0™ safeguards your facility – with every click, a new code is sent to the commercial door operator so the door opens only for you. Timer-To-Close conveniently and confidently closes the commercial door automatically after a predetermined amount of time has elapsed for added security and peace of mind. Emergency Disconnect disconnects the operator from the door for manual lifting in an emergency.